Swordfish are easy to recognize by their long, slender bills that gives them their name. Swordfish have a distinct dorsal fin and powerful streamlined bodies ranging from 5 to 12 feet long for most adults. Making a costume at home to imitate the swordfish is not as difficult as it may at first seem. The costume requires no sewing and only a few special supplies. Most swordfish have a blue color but some may also have a gray, green or even brown tint, and you can use these colors to make the costume as well, if desired. Draw the outline of a swordfish’s back fin onto a piece of paper. 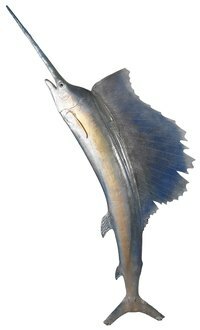 A swordfish has a long, narrow fin with many small ridges. The ridge nearest the head is twice as long as the rest of the ridges. Transfer the design to a piece of upholstery foam. Make the fin about as long as your back, or the back of the person who will wear the costume. Cut out the fin with scissors. Draw a long sword shape onto the foam piece. Make the sword shape about 2 feet long. Cut out two of the sword shapes. Cut a piece of wire 24 inches long. Glue the wire to the middle of one of the sword pieces. Glue the second sword piece over the wire. The wire will stabilize the sword and help it stand upright while wearing the costume. Allow the glue to dry overnight. Spray paint the foam pieces blue. Allow the foam to dry overnight. Glue the foam fin to the back of the sweatshirt with hot glue. Glue the sword fin to the top of a beanie hat with hot glue. Put on the sweatshirt and shoes. Pull the hat over your head. Paint your face and neck blue with the face paint. Sea Grant; Swordfish; Malia Schwartz, et al.